Are you looking for a way to make lunches that are cheap, healthy, and fun for your kids or for you? Bento lunches might be your answer. 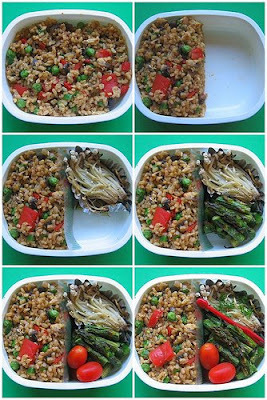 Deborah Hamilton (Biggie) writes all about bento lunches at her blog, Lunch in a Box. In this interview, she shares some bento basics and lets us in on how bento has worked for her family. Why do you go by Biggie? It’s been my nickname since Junior High School because I have big feet. We made this big foot club and you had to have size 10 or above to be in it. My friends shortened it to Biggie. That’s all - I am not a gangster rapper! A bento lunch is a compact, balanced, visually appealing lunch in a box. It’s pretty straightforward. It doesn’t have to be all Japanese food. It can be really anything you like, although some foods really lend themselves better to being transported. What makes bento lunches different from typical American-style lunches? One thing is that they tend to be waste-free lunches and you’re using a reusable container -the fact that it’s a number of different things in one container as opposed to “I’ve got a snack pack here; I’ve got a sandwich in a baggie over there.” It focuses more on incorporating things into one or two containers in an attractive manner. Aside from having less waste, what other advantages are there to a bento box? For me, it’s less clutter in the diaper bag. Also, I think it’s a portion control aspect. If you use, for example, a 600 ml box and pack it compactly, without junk food, candy, or greasy and oily foods, then it’s a one-to-one ratio of calories to the capacity of the box. So, if you’ve got a 600 ml box, you should be packing, basically, a 600 calorie meal. It’s easy portion control if you just have the one container and you use the bento packing guidelines. That way you can lose some weight, make sure that you're not overeating or undereating, and make sure that you get a balanced lunch. I think it makes portion control easier. What are the bento packing guidelines? Bento packing guidelines can be found on Biggie's blog. I’ve got them on my website. It's three parts carbohydrates (usually traditional Japanese bento style would be rice, but you can do pasta, muffins, bread or other grains), two parts fruits and vegetables, and one part protein. That’s basically it. Also, they should be packed compactly without a whole lot of empty space in the box. So, you use gap-fillers. Gap-fillers are small, tougher things like cherry tomatoes. Something that’s going to squish like a raspberry would be a rotten gap-filler. Gap-fillers help you keep the bentos stable during transport so you don’t have an avalanche of food when you open up the lid at lunchtime. Do you typically heat the whole bento lunch up in a microwave? It depends on how you pack it. Again, I’ve got a post on this. If they have a microwave where they're going to be eating, some people might like to pack a bento that only had microwavable foods in one container, and maybe pack another container with fruit or something that is not going to be microwave friendly, and keep that aside. My son's preschool does not have a microwave available, so all the kids eat room temperature food. Or, if you use thermal bento containers, then the food stays warm in the thermos. One thing to keep in mind, though, is the food safety issue. I think the food safety federal recommendation is to keep everything cold if it’s going to be held for longer than two hours at room temperature. So, that's when it's a good idea to look into an insulated lunch bag with some ice packs. There are also some foods that have natural antibacterial qualities to them (for example, oregano, cilantro, or wasabi). If you spice your food more heavily when you know you're going to be carrying it at room temperature for a longer period of time, that will help prevent food spoilage. Is lunch the only meal that you would do bento style? It just depends what our schedule is really. There’s no reason that a bento needs to be specifically a lunch. Occasionally, I’ll do a dinner. We’re not often out of the house for breakfast, so I don’t do those. But really, it’s just a meal in a box. You can put any meal that you like into a box. Sometimes we do breakfast for lunch where I make little tiny mini pancakes. You can freeze those too, so I’m not making them from scratch in the morning. But on the weekends, when I’m making pancakes anyway, I’ll just take the little extra batter and make tiny pancakes and mini sausages. 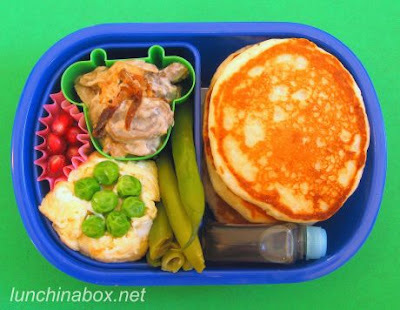 Bentos are really fun for miniature food. 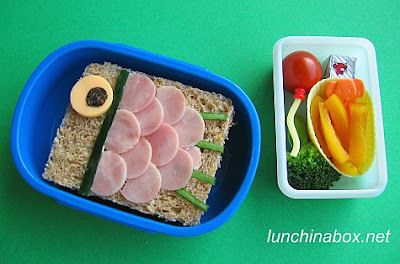 Speaking of cute food, why is there such a focus on the presentation in bento lunches? Biggie typically doesn't focus on food art, but check out this cute fish she made! If I were packing lunch just for myself, I don’t think that I would really focus on the attractiveness at all. But when I'm packing for a preschooler or for a child who might potentially have eating issues, I think if you make it attractive, it’s sort of like a surprise in a box. They are more likely to try foods that they wouldn’t otherwise want to, just because it’s interesting. You can do that with a balance of colors in a lunch, you can also do that with hardware by using little animal toothpicks or a little cute container or something like that. Some people take it to the extreme and make food art. People sculpt cartoon faces out of little pieces of food, which is altogether really too much effort for me. I’m kind of the lazy mom's bento. It doesn’t sound to me like you can be lazy and make bento lunches. Actually, you can. There are a lot of speed techniques and the freezer is your friend. It's possible to make a speedy bento in about 10 minutes, max. I aim for 10-15 minutes on the blog. The way that you can do that is by freezing leftovers or freezing cooked things in individual portions (like rice, muffins - you can do all kinds of little side dishes). If you have leftovers from dinner, you can pack up the leftovers and freeze them in little individual servings and pop out one at a time later. Or, you can get a head start on packing the next day's lunch with leftovers when you're cleaning up from dinner. But, it really doesn’t have to be a time consuming process. It’s basically just lunch in a box. How does your three year old son respond to the lunches? Well, he’s in a Japanese immersion preschool where pretty much everyone packs a bento lunch. So, it's the norm where he is because he's surrounded by kids all eating bento lunches. I think I fall on the spectrum smack down in the middle between the super-achiever moms who are making food art and the moms who are maybe throwing a sandwich into a bag. For him, it’s very run of the mill. It’s pretty normal. He does get excited on the rare occasions that I do make some food art or if he finds his favorite food in there. But all in all, we don’t make food an issue in our house. If he eats it, fine, if not, that’s okay too. I've found that I've had success personally in getting him to eat different foods just by not making a big deal out of it. I try not to show him how happy I am if he eats something, or if I'm unhappy that he didn't finish. Honestly, oftentimes if we're at dinner and we're eating something, he might turn up his nose initially. Then we're like, "Okay, fine, then don't eat it. More for us." Then when he sees us eating happily he decides to try it. I don’t make special children’s food for him. He eats what we eat. His bento lunches are just leftovers from what we had for dinner. Maybe I’ll make one additional dish in the morning. How did you get interested in bento? I speak Japanese and I worked at Japanese companies, but bento weren't really on my radar. I really got into it in 2004 when my husband was misdiagnosed with celiac disease, which is an intolerance to gluten found in wheat, barley, and rye. Basically, having celiac disease makes restaurant meals rather perilous - kind of dangerous to your health - because of the cross-contamination issue. I decided rather than having him be depressed at the office while he watched his colleagues go out to lunch, I would make him something where he would feel, “Aww, I have just as good of a meal as everyone else does.” So, I went to a Japanese book store here in town and got a couple books on bento. I was sure that there was some kind of a technique to it. I didn't have any idea of what kind of dishes might pack well so I just started hitting the books. Then, about 9 months later, my husband was undiagnosed. It turns out he did not have celiac disease after all, so we went back to gluten. Do you still make lunches for your husband? No, he's on his own now. Actually he wound up working from home for quite a while. So I'm not going to pack a lunch for someone who's just upstairs. He goes to the office sometimes and he can go to a restaurant. I don’t feel quite the level of caretaking that I did when he was misdiagnosed. Do you eat bento lunches or is it just for your son? I eat them on events or if we’re going to have a play date around lunch time. This weekend I made some because we went out to the beach. Once a week, we have a running club and I make bento for all of us then. On a day-to-day basis, I don’t make them just for myself anymore - only if I’ve got some sort of an outing or an excursion. Do people need any special products to get started making bento lunches? Not really. You can make it as small or as simple as you’d like - even just like a Rubbermaid box or Tupperware. Actually, my favorite containers are Lock 'n Lock. I have no commercial affiliations with Lock 'n Lock, but they have these great locking lids that go on plastic or glass Tupperware-like containers. They have a really good, secure, water-tight seal, and they are really cheap. I think Target or Wal-Mart may carry them. They’re very cheap, like $3. What's important is that that food container be shallow because it's difficult to pack a deep box with a variety of different foods at once. So you'll have more luck if you get a shallow container. If you want to go all out, then you can go the route of buying bento accessories or thermal lunch jars, like the Mr. Bento. They have bento kits; there's really no end to the way you can spend money on this kind of thing if that's what you want to do. But it does not have to be expensive. Packing lunches will wind up saving you money over restaurant meals. If I were just going to have a few containers, I would say a small one for my son, like a one-tier 360 ml box for a 3-year-old. Maybe a one-tier or a two-tier 600 ml box for an adult woman, and an 800 ml box for an adult man. Then a thermal food jar that you can find at stores like Target or Wal-Mart. The metal ones have very good heat retention and allow you to pack things like soup, curry, or stews, and even keeps something like rice warm and soft. How many bento boxes do you own? Do I have to say? Too many, but I’m very cheap. So, I try to get bargains and I usually don’t spend much money on any one individual box. What is your favorite bento lunch that you’ve made to date? This cold soba bento is one of Biggie's favorites! I guess it would be a cold soba lunch with a dipping sauce where I curled all of the individual little bits of noodles into little nests. Once you let them get cold, they start sticking together. So when you eat, you take a little bundle of the noodles, dip it into the sauce, and it's really refreshing summer meal that takes very little time to make in the morning. Also, it hits my nostalgia button for my time in Japan. 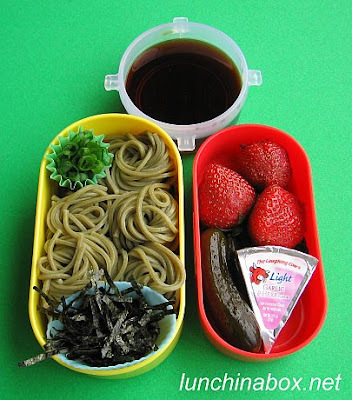 When did you decide to turn bento lunches into a blog? I guess in May of 2006, I just started snapping some photos of box lunches and loading them up onto Flickr so that I could participate in the bento communities on Flickr and also on Livejournal. I had a blog on Livejournal, but that was more repository of all the posts that I made in the Bentolunch community. I didn’t try to drive traffic there. It was just more my personal record. 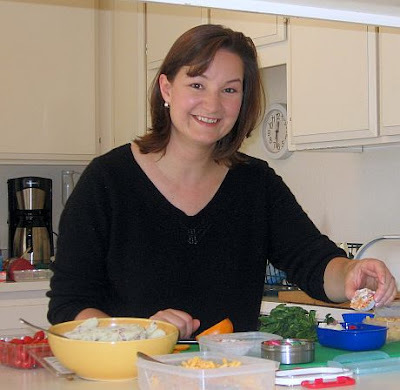 Then, in February of 2007, I was going through my Japanese-language bento cookbooks and finding all kinds of really ingenious tips and tricks to speed things up. I thought, “Oh my gosh, this is so interesting.” I started trying them out and writing about them on Flickr and on my posts, but then I found that I needed to refer back to more complicated explanations of techniques. In June of 2007, I got this stand-alone site, lunchinabox.net, and I just moved everything over there. Was the blog what you expected it to be? I had no idea what I was doing. My readers have been very patient and have stuck with me through my technical issues. It’s been a blast. It’s been very interesting from the technical standpoint and the blogging standpoint. My passion for the subject matter really keeps me motivated to keep going on the blog. Do you find that your readers are really into bento or are they just people who are checking it out for the first time? I'm finding that my readership consists of parents who pack lunch for their children, people with food allergies or food intolerances, dieters, environmentally conscious "green" people, Japanophiles, and also the frugally minded who want to save money by not eating out. This is my day job. I was a stay at home mom, and then I started making money off of the blog. That allows me to really spend time with my son, and it gives me some flexibility with my schedule that I'm really enjoying. It’s a luxury for which I’m very grateful. I used to be in public relations. That probably helps you in terms of promoting your blog. Well, I haven't actually done any media outreach at all (bad PR person!). It does give me a sense for the importance of understanding your readers and getting the word out. It’s impossible, but I would just love to sit down with M. F. K. Fisher for hours and talk to her about food. She wrote a bunch of different food books. I just really enjoy her storytelling and her passion for food. She seems like a real, approachable person with a passion for food that I respect. Biggie's blog is one of my favorites, and it's wonderful to read this interview and learn more about how and why she started her blog. Thanks! Great interview, as always. I never knew there was such a big community of bento makers, so much that Biggie earns enough income to stay home. I absolutely love Lunch in a Box. I really appreciate Biggie's passion for making bento boxes. I stumbled upon her blog a year or so ago and appreciate the passion she puts into her posts, the visual components, and how relatable she is (even if I don't have kids). She does an amazing job and it was interesting to read an interview, thanks! I'm a huge fan of Lunch in a Box. I don't pack lunches for myself or anyone else, but I absolutely love reading all of Biggie's tips and ideas and drooling over the gorgeous pictures of her bento lunches.